Tillerson: Trump Is Using Language Kim Jong Un Can Understand : The Two-Way When asked if Americans should be worried about tensions with North Korea, Secretary of State Rex Tillerson replied, "I think Americans should sleep well at night." Secretary of State Rex Tillerson says North Korea's Kim Jong Un "doesn't seem to understand diplomatic language." As the leaders of two nuclear-armed countries trade threats, U.S. Secretary of State Rex Tillerson says President Trump "is sending a strong message to North Korea in language that Kim Jong Un would understand, because he doesn't seem to understand diplomatic language." The language has been increasingly fiery. After Trump said Tuesday that if North Korea continues to threaten the U.S., it would "be met with fire and fury like the world has never seen," the North Korean regime responded by saying it's considering a missile strike on the U.S. Pacific territory of Guam. Trump's remarks were criticized by fellow Republican Sen. John McCain, who told an Arizona radio station, "I don't know what he's saying, and I've long ago given up trying to interpret what he says." "That kind of rhetoric, I'm not sure that helps," McCain said, adding later, "The great leaders I've seen, they don't threaten unless they are ready to act. And I'm not sure that President Trump is ready to act. Maybe it'll turn out all right — he's the president, I'm not." Even if the U.S. were to attack North Korea, McCain said, the regime would be able to rain rockets on targets in South Korea. Tillerson offered his take on the current tensions during a quick stop Wednesday in Guam, where his plane refueled on a tour that has included a meeting of the Association of Southeast Asian Nations. Speaking to reporters on the plane, Tillerson said he didn't see an imminent threat to Guam and hadn't considered changing his route. Tillerson was also asked if Americans should be worried, according to the pool report. He replied, "I think Americans should sleep well at night" and not be concerned by recent statements. Discussing the military threat posed by North Korea, Secretary of Defense Jim Mattis said on Wednesday that the nation "must choose to stop isolating itself and stand down its pursuit of nuclear weapons," adding, "The DPRK should cease any consideration of actions that would lead to the end of its regime and the destruction of its people." "While our State Department is making every effort to resolve this global threat through diplomatic means," Mattis said, "it must be noted that the combined allied militaries now possess the most precise, rehearsed and robust defensive and offensive capabilities on Earth." The escalation in rhetoric follows a U.N. Security Council resolution to strengthen economic sanctions against North Korea — a measure that could block roughly a third of the country's exports. And on the same day Trump and Kim exchanged barbs, a report emerged that U.S. intelligence analysts believe North Korea has succeeded in producing a miniaturized nuclear warhead that can fit on its missiles. Speaking Wednesday morning, Tillerson said, "Nothing I have seen and nothing I know of would indicate that situation has dramatically changed in the last 24 hours." As for the recent exchanges between Trump and North Korea, Tillerson said, "I think the U.S. and the international community with respect to North Korea, has actually had a pretty good week," citing the sanctions and statements of solidarity from nations at the ASEAN meetings in the Philippines. The U.N. sanctions were passed unanimously over the weekend; on Monday, North Korea accused the U.S. of a "felonious crime" and threatened "to take ultimate measures." "North Korea's rhetoric is just ratcheted up, louder and louder and more threatening. So I think the president, what the president is doing is sending a strong message to North Korea in language that Kim Jong Un would understand, because he doesn't seem to understand diplomatic language. "I think the president just wanted to be clear to the North Korean regime that the U.S. has unquestionable ability to defend itself, will defend itself and its allies, and I think it was important that he deliver that message to avoid any miscalculation on their part." 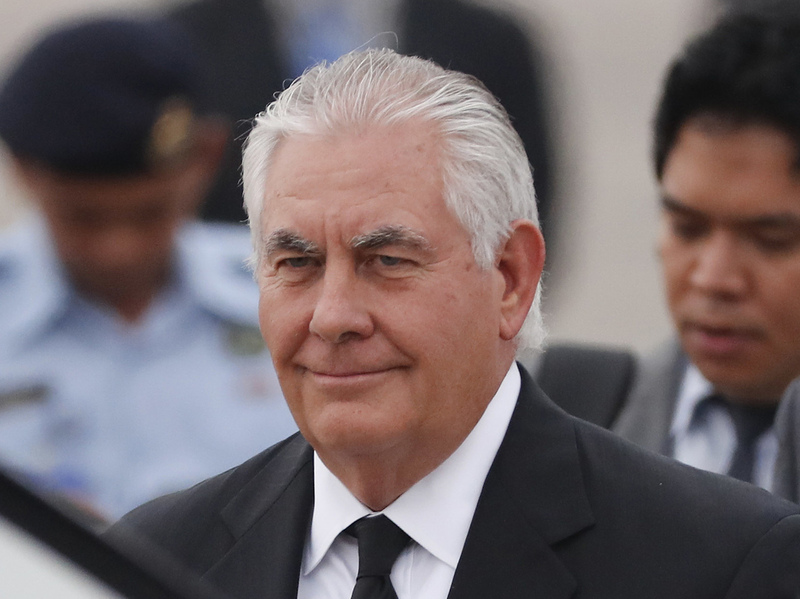 North Korea's change in tone shows that it's feeling pressure in the face of an international community that wants stability on the Korean peninsula, Tillerson said. "Whether we've got them backed into a corner or not is difficult to say," he added. "But diplomatically you never like to have someone in a corner without a way for them to get out." As for what North Korea's way out looks like, Tillerson replied that the country's leaders in Pyongyang should agree to talks about its nuclear program — and with "the right expectations" of the scope of the discussion.